Around a week ago, I caught up with Balan, a keen gardener and one who hates seeing things go to waste. He handed me some oyster mushroom kits to try, plus extra to share with friends, and also gave me a Cuban Oregano seedling. I was so excited, I’ve always wanted to grow mushrooms, but it all seemed a bit complicated. 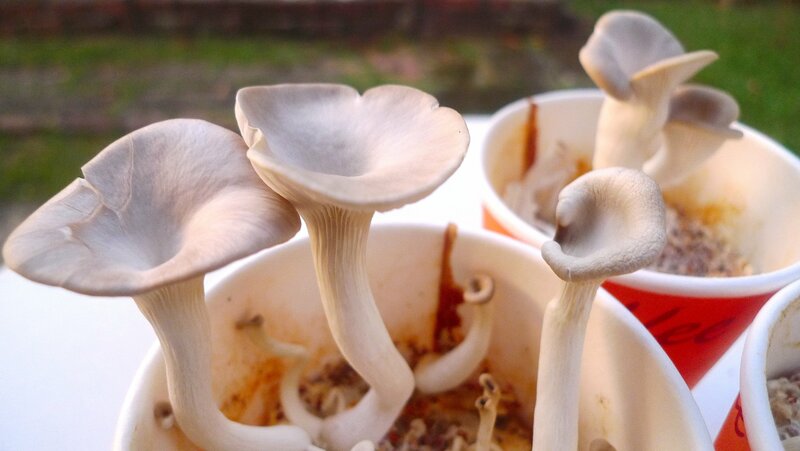 Grown on a substrate of spent coffee grounds, the mushroom spawn come prepared in paper cups, and all you’ll need to do is add water. It’s all grown naturally, so it’s safe for consumption. 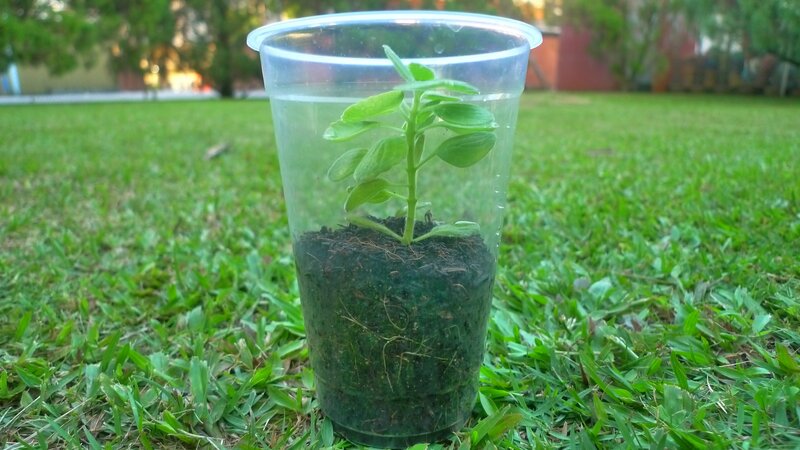 When it is launched in the near future, the kits will come in reused paper cups, and he hopes to make it as eco as possible. I’ll announce that when it happens, because I think many people will be keen to try it out! This is what it looks like when I received them. It needs to be kept cool and moist in order for the mushrooms to grow well. He gave me instructions to mist it twice a day, but with this sweltering heat, I had to keep checking on them, and I covered them with a damp cloth. Because my home doesn’t have many cool spots in the backyard (my mom forbade me to grow it indoors fearing rogue spores would get lodged in my lungs) the cloth kept drying out. One solution around that would be to put them in a box with a fair amount of depth, and drape a damp cloth over. These mushrooms grow pretty fast, and get to this size in around 4 days. I sampled some today and it tasted pretty good! 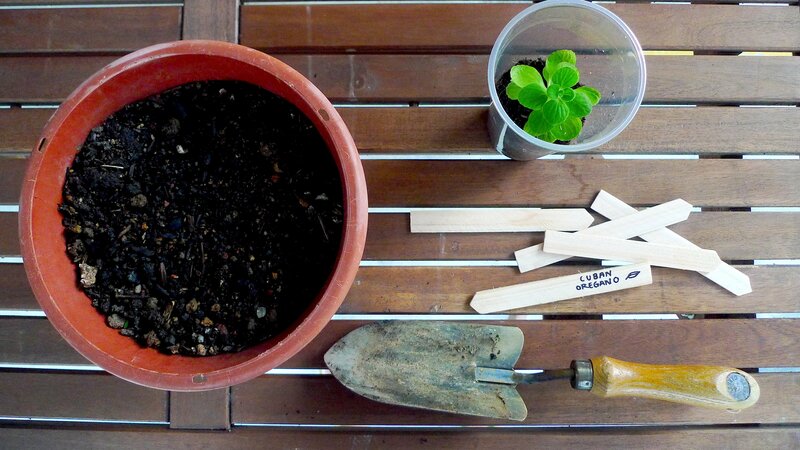 Here’s the Cuban Oregano seedling that Balan gave me, which I promptly potted, and it now joins my other herbs (on a very well-loved plant rack, as you can tell). He’s testing out other mushrooms, so I can’t wait to try the others! Hi Sunny, you can get in touch with Balan at balansg[at]rocketmail[dot]com. Best of luck! can you spare me one mushroom? 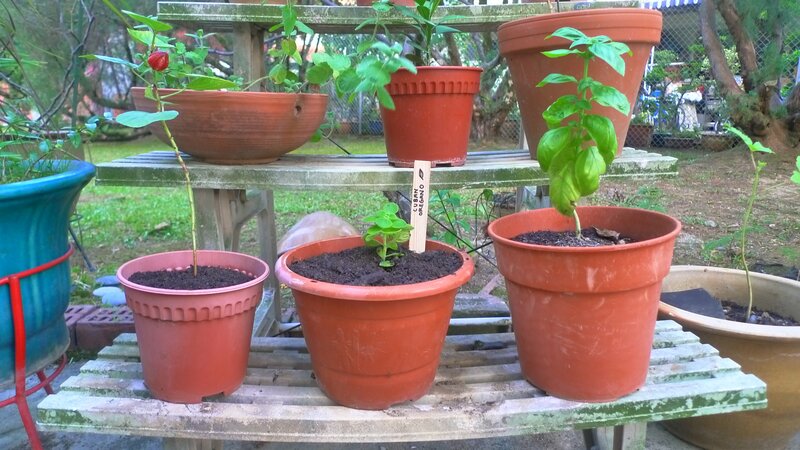 Those mushrooms have come and gone… you might wish to visit Herb in a Cup’s facebook page and ask him for a mushroom grow kit. Hi ! does anyone know where to get spores of the chinese LingZhi mushroom? 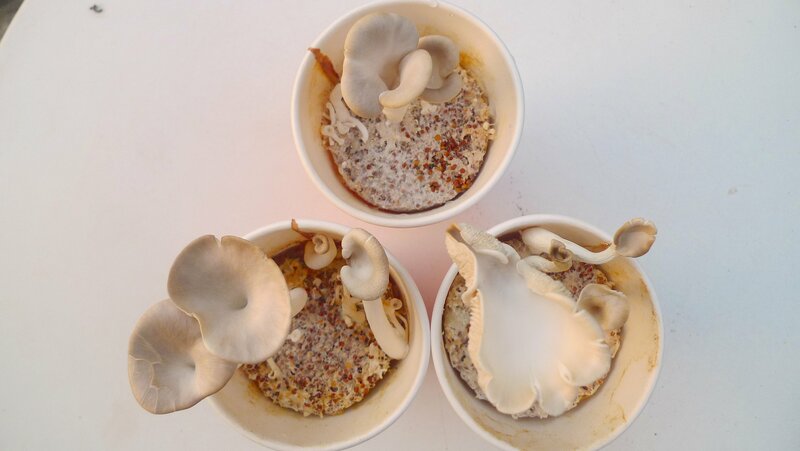 Hi Jim, you may wish to look up @bewilder_sg on instagram http://www.instagram.com/bewilder_sg, Kiat has experience growing linzhi mushrooms.